Black Ice Software - Print2Email version 9.37 is released! Print2Email version 9.37 is released! Audit Logging and New features for POS (Point of Sales) with predefined the email subject and body! Black Ice Software has released Print2Email version 9.37 for POS (Point of Sales) receipt printing. The Print2Email can be combined with POS systems to automate email sending to customers. New features added specifically for POS email distribution are Audit Logging, predefine the Email Subject and Email body, simple user interface to prompt a clerk to enter the recipients email address. These new features are especially useful for Point of Sale systems to send out emails with the same subject and body but for customers (for example; price offers, marketing text, and coupon codes, etc.). 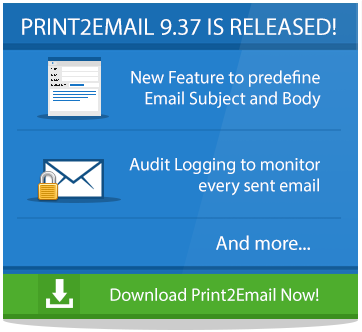 Version 9.37 of the Print2Email also contains a new Audit Logging feature, which logs every email sent on the system including date, time, recipients and the Windows User name who sent the email. This option could be very useful for Administrators to collect customer data (email address and frequency) and monitor the outgoing emails. Besides the new features, the latest version of the Print2Email includes several minor user interface changes. This release also includes licensing and installation improvements, stability improvements for installing the Print2Email on Citrix systems, Improved default settings and email setup during installation and updated documentation to enhance user's experience. MSI installation available for large scale deployment. Do not forget to subscribe to future releases by purchasing maintenance. With an active maintenance subscription, you will receive all new releases for free! Priority email technical support is also included in your subscription. For more information, call us at +1 (561) 757-4107 Extension 3, or impactsales@blackice.com.